NinjaBee Games: Get Both Keflings Games this week for 1/2 Off! This week Xbox 360 gamers can get their hands on both of NinjaBee's hit Keflings games, A Kingdom for Keflings and A World of Keflings, for 50% off! Each game is part of separate week-long Xbox Live promotion that will cut its price in half from 800 to 400 Microsoft Points. That's double the Keflings for half the price! 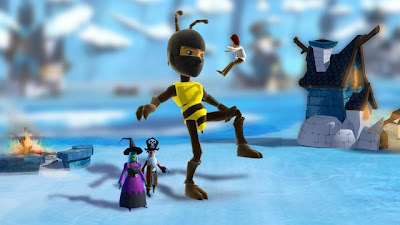 A Kingdom for Keflings, the first XBLA game to allow gamers to play as their Xbox Live Avatar, is part of Xbox Live's "Extreme Shopping" sale and is available to both Gold and Silver Xbox Live members. The sequel, A World of Keflings, is one of four games featured as part of this week's "Arcade Four-Play" Deal of the Week. As is Xbox Live's policy, the Deal of the Week program is available only to Xbox Live Gold members. Both sales run from Tuesday, March 29 through Monday, April 4.